I wanted to do something a little different so I borrowed a few photos from my other blog, The Sweetest of Days (where I'm sorry to say I no longer publish), and played around on Picnik and Photoshop. I hope you enjoy the results. * I hope you have had the chance to stop by the International Bird Rescue Research Center (over on the side of my blog). They have all the info on oiled bird care from the gulf oil spill. These are wonderful! I love the post processing and the photo with the Thoreau quote is perfect. These are beautiful, Sharon. I love that texture in the last photo with all the sparkles. That IS a texture, isn't it? I love the first quote. Never thought of life's cures that way, but it really is o so true. Beautiful pics! Love what you've done with them. P.S. Sharon, meant to tell you that the sayings near the photos are great, too! Love them! Love the colors you chose to pair up with your photos! Very nice and such a true beachy feel to them. I also love the photos and quotes about the beach...it's a special place to our family as well. Thanks ever so much for the link to the bird rescue blog...I vividly remember the Exxon Valdez...I am a Dawn user simply because of all the good the company did then helping to wash the birds and help them return to some semblance of normal life. Praying for our beaches and the lives that dwell and depend on them. Such great pictures Sharon. Well done with the textures. Beautiful edits. I wish I knew how to apply them successfully to my photos. Those are so creative and beautiful Sharon! To my friend, the artist. Your work is amazing! You always inspire me...!!! 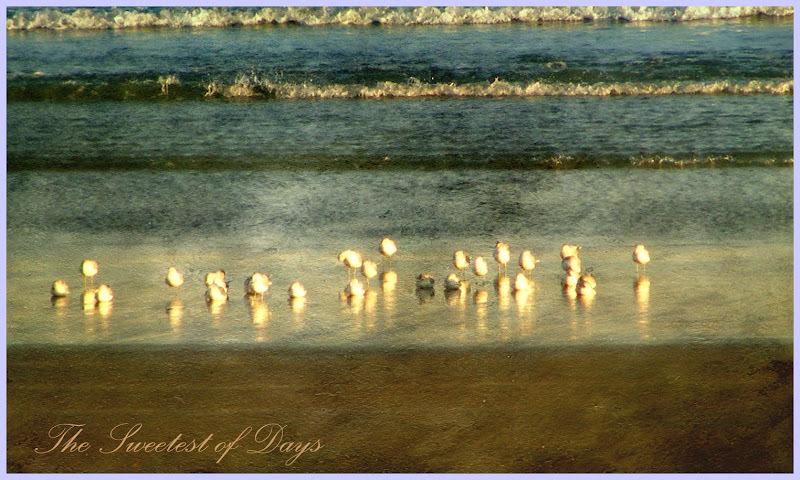 I have a place in my heart for our feathered friends... especially the ones on the beach! Very pretty - you did good. The photos themselves are gorgeous, and the added effects just takes them over the edge. My favorite is the first one - I love the quote AND the photo! I've yet to try that website! Will have to do that one of these days! What a great idea! Excellent work Sharon! These would make great note and thank you cards. Sharon, these are absolutely gorgeous!!! You should really do a calender or note cards from them... LOVE the processing! These are beautiful Sharon! Mary is right -- you should make a calendar or note cards. My favorite is that third shot, but my oh my I love them all...!!! I love the quotes with the photos. The photos as always are fabulous. You certainly have a gift for capturing the beauty of nature. Beautiful. Your photographs evoke deep feelings of my childhood summers in New England. Your artistry has a true sense of what I call "Romance of Place". Thanks for sharing. Absolutely gorgeous! I LOVE the first quote. I'll be adding that to my collection. I'm a big fan of Victoria Magazine, as well, although I haven't purchased a copy in a few years. The photos complement the words perfectly. I love the first quote, by Isak Dinesen! Excellent editing and choice of words! I long to be at the beach again. I took it for granted most of my life.